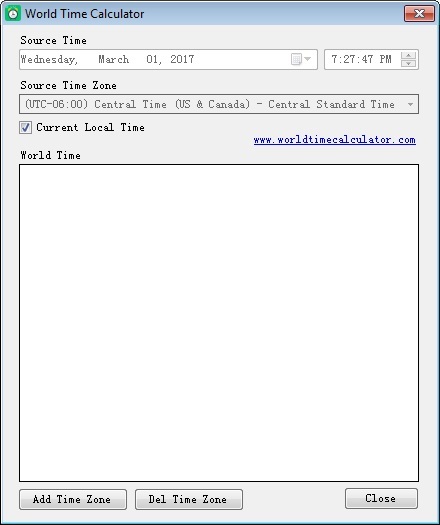 World Time Calculator is a free tool to calculate time between difference timezones, it can help you calculate the time of multiple cities/countries. Software is simple and easy to use, it is a freeware and offered free of charge to everybody for personal and commercial use. Default source time is your current local time, and source timezone is current local timezone. 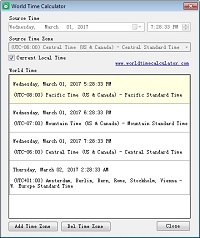 Software can calculate the time of multiple time zones at a time. Click button "Add Time Zone" to select a time zone you need, and click button "Del Time Zone" to delete a time zone. If check-box "Current Local Time" is selected, each time is automatically updated. 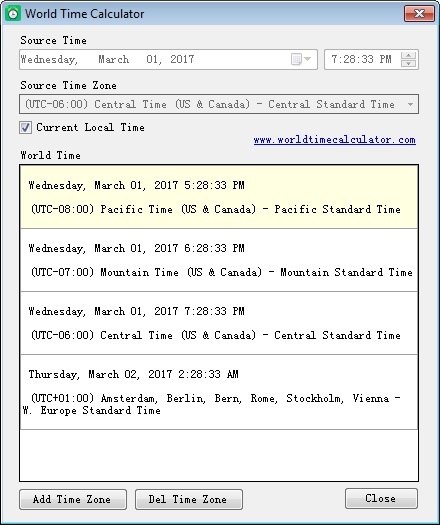 If check-box "Current Local Time" is not selected, you can set another time and another time zone as source time. Software will save the time zone you have added in your PC, while next your launch software, software will automatically show the time of these time zones, this feature will facilitate your use. If you no need save data, you can remove all selected time zones, software will remove the stored data. 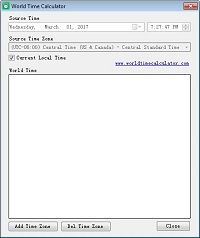 Software will read and show the time zone data in your Windows PC, time zone data will be different depending on the version and language of your Windows operating system. If necessary, software will calculate the daylight saving time. If you are a businessman and have business around the world, or you are a world tourist, this software will be a good handy tool for you.